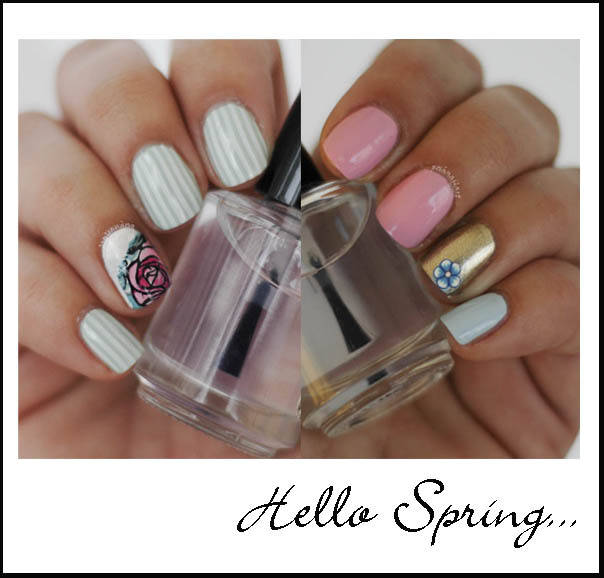 Spring manicures… I have to admit, winter has been harsh for my hands. No matter how much I moisturised, my cuticles were dry and chappy all winter. If you are like me, before your spring manicure, you have to get rid of those dry cuticles. Here’s a quick remedy I use; 2 pumps of my favorite hand cream (the greasiest, the better) and a teaspoon of brown granulated sugar. Mix these two in the bathroom and give your hands a good rub. If you have nailpolish on, be careful, since the brown sugar may scratch it. Wash your hands with warm water and gentle soap and enjoy your supersoft hands. You may use a cuticle remover and push back those cuticles with an orange stick if you have more time. For my first manicure, I used a lovely mint green as my base. With a white polish, I stamped the stripes on. For the ring finger, I started with 2 coats of white polish. 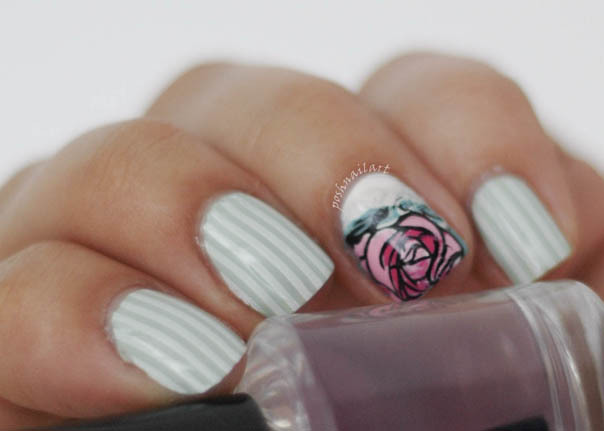 I used the reverse stamping technique for the rose, which is basicly stamping your image on a silicone mat, coloring it with nail polish, covering it with a clear topcoat and removing it from the mat once it is all dry. Then you place it on your semi-dry base, and voila! 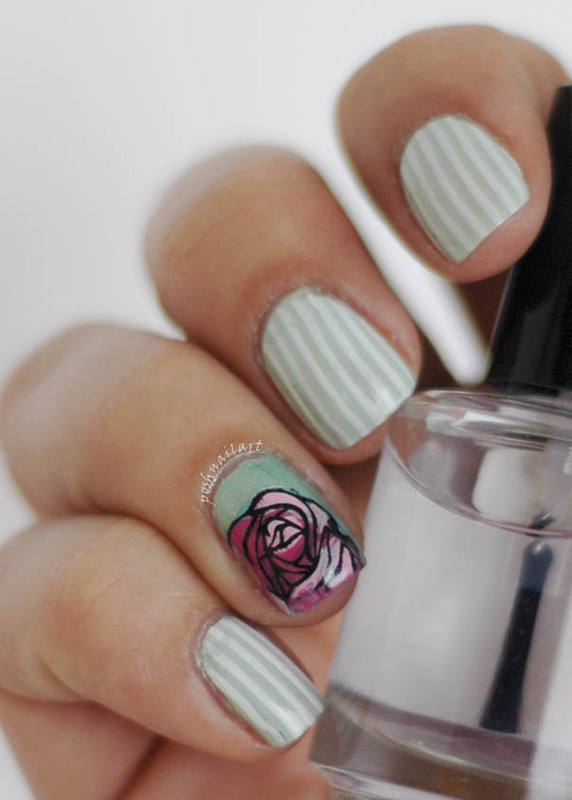 Don’t forget to finish with a fast drying top coat. For my right hand, I used a green polish instead of a white base. I really cannot tell which one I like best. For the second manicure, I went with baby blue and baby pink. For my accent nail I chose gold, because I think it looks so nice with pink and blue. With a dotting tool, I made 5 blue dots and 1 white dot to make the flower. Finish with a fast drying top coat, as usual. 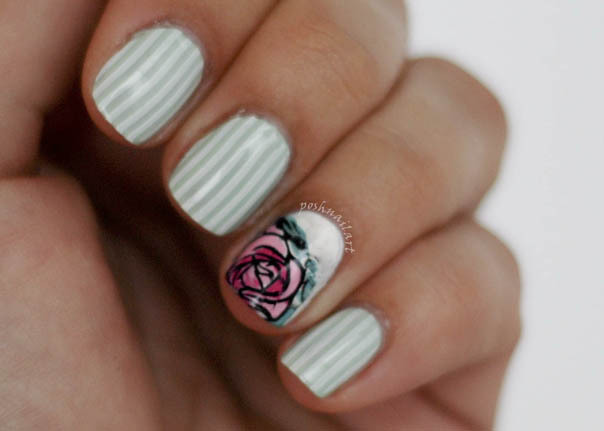 For more nail art designs, check out Posh Nail Art.